Flip Out Mama: Book Review: Drugs Make You UnSmarter By Jill Vanderwood PLUS GIVEAWAY! Book Review: Drugs Make You UnSmarter By Jill Vanderwood PLUS GIVEAWAY! Today we have a great book review for you! 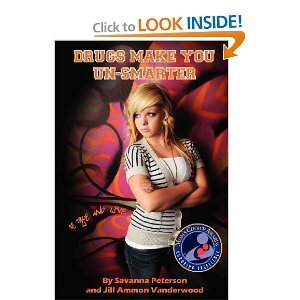 The book is called Drugs Make You Un-Smarter by Savanna Peterson and Jill Vanderwood. When I found out that this book was a winner of the prestigious Mom's Choice Award, I knew that it was going to be good. This book is really eye opening. It is about the struggles of drug and alcohol addiction through the eyes of a fifteen year old girl whose family has been enveloped in the harsh world of drug abuse for her whole life. Savanna and her grandmother wrote this book, and in it, Savanna details her experiences and memories of a life affected by the drug abuse of those around her. The way that Savanna talks about the things that she was exposed to as a child is very matter-of-fact, which makes it kind of hard to read. It just hurts to read what this young girl has had to go through in her life. However, Savanna is very strong and tough and it is inspiring to see that she has been able to keep away from all of the bad things that have affected others in her family. This book really should be made available to teens and tweens everywhere. It tells the truth about drugs and alcohol abuse, and it does it in a way that kids can respond and relate to. The book is also a good read for parents who need a reality check about what exactly our kids are going through these days. It's really inspiring to see what a strong girl Savanna is and how she has managed to keep her head up through all of the struggles that her family has faced. All in all, this book is a good read for both teens and parents. It helps to know what our young people are going through these days and that there is a way to avoid these hardships. I would recommend this book to everyone as a real eye opener! To buy this book, click here! We are also going to be giving away a copy of this book to one lucky Flip Out Mama reader! To be entered into the giveaway, leave a comment below telling me why you want to read this book! Winner will be selected on Monday, 11/12/2012 at approx 10pm EST and will be chosen via random.org. Sponsor is in charge of prize fulfillment and shipment. We received a sample copy to review, however, all thoughts and opinions are our own.